University of Illinois bioengineers, from left, Ayanjeet Ghosh, professor Rohit Bhargava, Prabuddha Mukherjee and Sanghamitra Deb are using an updated infrared imaging technique to better examine and optimize a group of materials that could help solve some of the world’s most challenging energy, environmental and pharmaceutical challenges. CHAMPAIGN, Ill. — A team of University of Illinois bioengineers has taken a new look at an old tool to help characterize a class of materials called metal organic frameworks – MOFs for short. MOFs are used to detect, purify and store gases, and could help solve some of the world's most challenging energy, environmental and pharmaceutical challenges – they can even pull water molecules straight from the air to provide relief from drought. 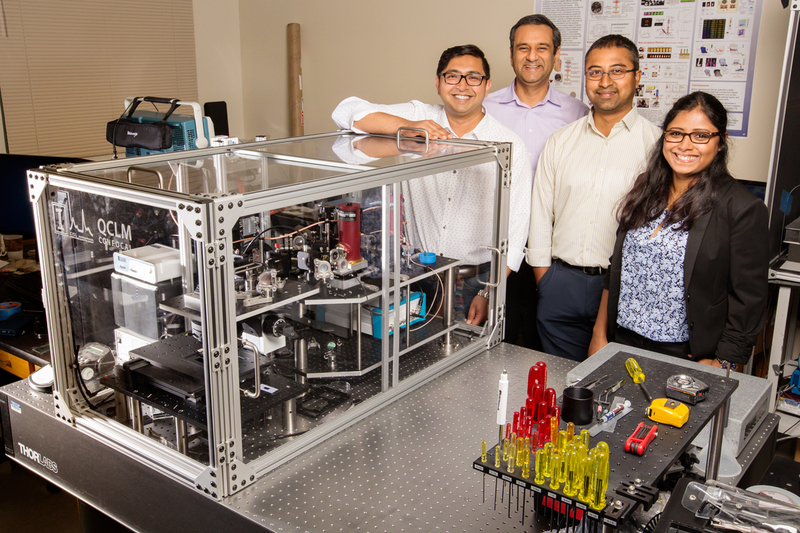 The research team, led by bioengineering professor Rohit Bhargava, is using infrared chemical imaging to examine and optimize the structure of MOFs. Although around for more than a decade, IR imaging is greatly underutilized in materials analysis. The researchers found that with a few modifications to improve the speed of analysis, it is the perfect tool for this application. Their findings are published in the Journal of Physical Chemistry Letters. MOFs are microscopic-scale porous crystals engineered from metal ions bound together by organic molecules called ligands. Although they are tiny, they have an immense absorptive ability. “The pores allow the MOFs to work like tiny sponges that can soak up chemicals such as pharmaceuticals and gases,” said Sanghamitra Deb, a postdoctoral researcher at the Beckman Institute for Advanced Science and Technology at the U. of I. The traditional methods used in materials science analysis, like high-powered electron microscopy and spectroscopy, do not combine chemical insights with the spatial resolution of IR imaging, the researchers said, so they can only provide average chemical measurements. MOFs form by crystallizing out of a solution, and there is no way of fully controlling their structure or chemistry. “This lack of control leaves a lot of room for defects to form, and the traditional methods for characterization only tell us that there is a defect but cannot pinpoint the specific location,” Mukherjee said. IR imaging also offers a unique scale range to work in, the researchers said. “This unique use of an older technique, but with new instrumentation, allows us to quickly determine the quality and best application for specific MOFs in a nondestructive way – something no other group has been able to do,” Mukherjee said. The group envisions this technique being used with other devices made under similar conditions, as well as uses outside of the materials science realm. The Agilent Thought Leader Award supported this research. To reach Rohit Bhargava, call 217-265-6596; rxb@illinois.edu. The paper “Mapping solvation environments in porous metal organic frameworks with infrared chemical imaging” is available online and from the U. of I. News Bureau.